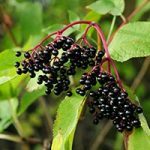 In addition to a few ornamental cultivars, we are offering a selection of European and American elder cultivars which have been selected for their good fruiting ability and fruit size and quality. If flowers are the crop, then they (of course) produce extra large crops of flowers too. European elders come from Denmark, Norway, Eastern Europe and England and are grown commercially in several countries. Plants are supplied as bare-rooted or potted, 30-60 cm plants. American elderberry, Sambucus canadensis is a large suckering shrub growing 2-3 m (6-10 ft) high, with very large flower heads. Not self-fertile, and rarely cross-pollinating with the European elder (as the latter flowers before it), so if one of these selections is grown alone it flowers non-stop from late July until November. This is ideal if the flowers are the crop required; the flowers can be used much like those of the European elder, ie can be cooked – dipped in batter and fried – or soaked in water to make a refreshing drink, or made into wine. With pollination, fruits are produced which can be used just like those of the native elder – for wine or cooked etc. A superb plant which grows in most sites in sun or part shade; very hardy but stems often die off, resprouting from the ground. Plants are supplied as bare-rooted, 30-60 cm plants.